LIMA (Reuters) - Peru's fractured Congress will force the winner of next month's presidential election to build alliances and steer away from authoritarian policies, whether it is left-winger Ollanta Humala or his right-wing rival Keiko Fujimori. Both of the candidates in the June 5 run-off vote are polarizing figures but neither saw their parties win a majority of seats in Congress in April 10 voting. Humala, a former military officer who once led a short revolt against the government, has already dropped some of his more radical plans for a new constitution and major tax reforms and he promises to be a conciliatory leader, unlike his former political mentor, Venezuelan President Hugo Chavez. Fujimori, 35, is keen to show she won't follow the path of her father, Alberto Fujimori, who shut down Congress in 1992 when he was president to pass tough anti-terrorism laws that suspended civil liberties. She has also apologized for his abuses of power. 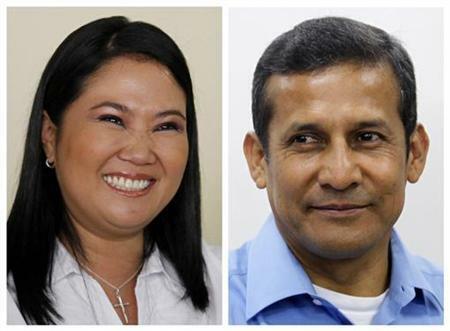 With three centrist candidates knocked out of the election in the first round, some have feared the next president might show little respect for democratic institutions or, in the case of the 48-year-old Humala, unwind years of economic progress. But the balance of power in Congress should help prevent a sharp turn to the left or right after the run-off election. It will also be difficult to alter many of the free-market reforms that have been implemented over the past 20 years, drawing in billions of dollars in investment and turning Peru into one of the world's fastest-growing economies. "I do not think there will be a doomsday scenario that leads to a dictatorship ... or anti-democratic politics," said Oscar Vidarte, a political science professor at Lima's Catholic University. Still, with so much fragmentation, the next president will have to show real skill to forge consensus. "Neither candidate has (deep) experience in democratic politics," said Steven Levitsky, a Harvard University government professor doing research in Lima. "Tolerating criticism, this is something you learn after decades of participating in democratic institutions." Though Fujimori is a member of Congress, she hasn't spearheaded any major legislation and, as a teenager, she served in her father's authoritarian government as first lady after he separated from her mother. Humala's Nationalist Party will have 47 of 130 seats in the next Congress while Fuerza 2011, Fujimori's party, will have 37. There are three blocs in the center that they will need to woo: the 21 seats of former President Alejandro Toledo's party, the 12 seats of third-placed presidential candidate Pedro Pablo Kuczynski's "Alliance for the Big Change," and the nine seats of former Lima Mayor Luis Castaneda's party. Outgoing President Alan Garcia's ruling APRA party, once Peru's most powerful party, won just four seats. None of those centrist parties have endorsed Humala or Fujimori for the presidency. That may make it difficult for Fujimori and Humala, who both appeal to poor voters, to pass two proposals that they agree on but critics say could hurt investment. They both want to tax the windfall profits of firms in Peru's vast mining sector to fund social programs in a country where a third of voters live in poverty. They also support a revised version of an indigenous rights law, known as the law of consultation, that has been pending in Congress since Garcia vetoed it in May 2010. Garcia has said it would threaten crucial investment at a time of a global commodities boom by giving tribes more control over whether mines or oil wells can be installed on their ancestral lands. But Peru's human rights office says the law would help mitigate around 200 conflicts over natural resources in Peru that often turn deadly and pose real operating risks for companies. People in rural towns frequently protest to stop mining projects for fear they will cause pollution or to demand more direct benefits for the local population. While it will be difficult, there is a chance Humala or Fujimori could build effective alliances because there is little party loyalty in Peru and legislators often easily change their voting allegiances. "I'm sure both of them will fight for consensus in Congress," said Manuel Torrado, the director of local pollster Datum. "This will be critical to governing."